The DVD day's are numbered. Discussion in 'DVD' started by [email protected], Mar 11, 2018. The DVD day's are numbered. Just like the Laser Disc,VHS Tapes. I still like my movies & TV shows in my hand...Yes I have Amazon, Hulu, Warner Archives, NetFlix, FilmStruck. But i still buy DVD's. Laser Disc. And have over 250 VHS tapes. But like the VHS Tapes & Laser Disc. DVD's there days are numbered. Ed Lachmann, BarryR, PMF and 9 others like this. Ed Lachmann, Bob Bielski and Darby67 like this. That's OK, so are mine -- as long as my number is smaller then nothing will change. Ed Lachmann, BarryR, PMF and 11 others like this. Bob Bielski, BarryR, Jack K and 1 other person like this. Detour (1945), Bob Bielski, PMF and 1 other person like this. moviefanatic1979, Bob Bielski, BarryR and 6 others like this. Jack K, Mike Boone and Darby67 like this. Sadly even when the studios do release a classic "jewel" like Bridge on the River Kwai on UHD disc, people barely notice. Mike Boone, Darby67 and Jason_V like this. Yup, that's pretty much me, & after my lifetime...who cares. Like many here, I'm from a generation who likes to own "stuff", but I'm sure the youngsters who don't need to own a physical copy & are happy to stream have the higher moral ground. Ed Lachmann, Detour (1945), BarryR and 2 others like this. EricSchulz, Darby67, MatthewA and 1 other person like this. Detour (1945), bmasters9, BarryR and 2 others like this. EricSchulz, BarryR, MatthewA and 6 others like this. Detour (1945), BarryR, TJPC and 2 others like this. EricSchulz, Ed Lachmann, Jack K and 3 others like this. Carabimero and Darby67 like this. 2018 through 2/24. Noting that there have been virtually no high profile releases since 1/1. The next 6 weeks will include Several Top 10 Box Office films including multiple Disney/Marvel items and/or items that should be UHD big sellers - Coco, Lady and the Tramp, Ragnarok, Justice League, Jumanji, and Star Wars. It wouldn't surprise me if BD/UHD ends up erasing the losses and passing up for the YTY numbers. 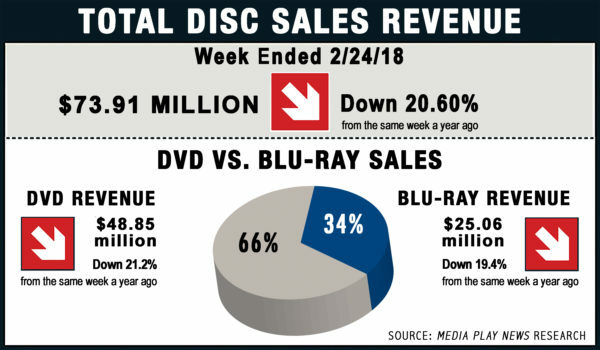 I most interested in seeing how many weeks BD outsells DVD over the next 6 weeks and possibly the first full month-6 wk time period that BD outsells DVD. BD has outsold DVD a handful of weeks over the last couple years, but never even back to back weeks. The biggest differential in 2017 the 3 weeks it happened was $3M with Rogue One and in 2016 the single week it happened was $30 during TFA release week. BD was actually up for 2017 until Nov/Dec, but there was no new Big releases in the last 2 months to really push sales other than BF sales -- Cars 3, DespMe3? ?